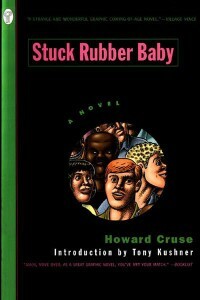 In 2005, Howard Cruse’s groundbreaking graphic novel Stuck Rubber Baby was challenged in the Montgomery County Memorial Library System along with 15 other young adult books with gay positive themes by the Library Patrons of Texas. The graphic novel tells the coming of age story of a young man who grows up queer in the South during the 1960s. The book explores issues of homophobia, racism and gay identity in a time period where all of those concerns were undergoing profound and revolutionary changes. Stuck Rubber Babywas honored with nominations for the American Library Association’s Lesbian and Gay Book Award and for the Lambda Literary award. It won Best Graphic Novel at the United Kingdom Comic Art Awards and the 2002 French Prix de la critique. The book was ultimately retained in the Montgomery County system, but was reclassified from Young Adult to Adult.